Meitnerium is a synthetic chemical element with symbol Mt and atomic number 109. It is an extremely radioactive synthetic element (an element not found in nature, but can be created in a laboratory). The most stable known isotope, meitnerium-278, has a half-life of 7.6 seconds, although the unconfirmed meitnerium-282 may have a longer half-life of 67 seconds. The GSI Helmholtz Centre for Heavy Ion Research near Darmstadt, Germany, first created this element in 1982. It is named after Lise Meitner. In the periodic table, meitnerium is a d-block transactinide element. It is a member of the 7th period and is placed in the group 9 elements, although no chemical experiments have yet been carried out to confirm that it behaves as the heavier homologue to iridium in group 9 as the seventh member of the 6d series of transition metals. Meitnerium is calculated to have similar properties to its lighter homologues, cobalt, rhodium, and iridium. Meitnerium was named after the physicist Lise Meitner, one of the discoverers of nuclear fission. This work was confirmed three years later at the Joint Institute for Nuclear Research at Dubna (then in the Soviet Union). Using Mendeleev's nomenclature for unnamed and undiscovered elements, meitnerium should be known as eka-iridium. In 1979, during the Transfermium Wars (but before the synthesis of meitnerium), IUPAC published recommendations according to which the element was to be called unnilennium (with the corresponding symbol of Une), a systematic element name as a placeholder, until the element was discovered (and the discovery then confirmed) and a permanent name was decided on. Although widely used in the chemical community on all levels, from chemistry classrooms to advanced textbooks, the recommendations were mostly ignored among scientists in the field, who either called it "element 109", with the symbol of E109, (109) or even simply 109, or used the proposed name "meitnerium". The naming of meitnerium was discussed in the element naming controversy regarding the names of elements 104 to 109, but meitnerium was the only proposal and thus was never disputed. The name meitnerium (Mt) was suggested by the GSI team in September 1992 in honor of the Austrian physicist Lise Meitner, a co-discoverer of protactinium (with Otto Hahn), and one of the discoverers of nuclear fission. In 1994 the name was recommended by IUPAC, and was officially adopted in 1997. It is thus the only element named specifically after a non-mythological woman (curium being named for both Pierre and Marie Curie). For a detailed list of information on the discovery of each individual meitnerium isotope, see Isotopes of meitnerium. Meitnerium has no stable or naturally occurring isotopes. Several radioactive isotopes have been synthesized in the laboratory, either by fusing two atoms or by observing the decay of heavier elements. Eight different isotopes of meitnerium have been reported with atomic masses 266, 268, 270, and 274–278, two of which, meitnerium-268 and meitnerium-270, have known but unconfirmed metastable states. A ninth isotope with atomic mass 282 is unconfirmed. Most of these decay predominantly through alpha decay, although some undergo spontaneous fission. 282Mt 67 s? α 1998? 290Fl(e−,νe2α)? All meitnerium isotopes are extremely unstable and radioactive; in general, heavier isotopes are more stable than the lighter. The most stable known meitnerium isotope, 278Mt, is also the heaviest known; it has a half-life of 7.6 seconds. The unconfirmed 282Mt is even heavier and appears to have a longer half-life of 67 seconds. A metastable nuclear isomer, 270mMt, has been reported to also have a half-life of over a second. The isotopes 276Mt and 274Mt have half-lives of 0.72 and 0.44 seconds respectively. The remaining four isotopes have half-lives between 1 and 20 milliseconds. Meitnerium is the seventh member of the 6d series of transition metals. Since element 112 (copernicium) has been shown to be a group 12 metal, it is expected that all the elements from 104 to 111 would continue a fourth transition metal series, with meitnerium as part of the platinum group metals. Calculations on its ionization potentials and atomic and ionic radii are similar to that of its lighter homologue iridium, thus implying that meitnerium's basic properties will resemble those of the other group 9 elements, cobalt, rhodium, and iridium. Prediction of the probable chemical properties of meitnerium has not received much attention recently. Meitnerium is expected to be a noble metal. Based on the most stable oxidation states of the lighter group 9 elements, the most stable oxidation states of meitnerium are predicted to be the +6, +3, and +1 states, with the +3 state being the most stable in aqueous solutions. In comparison, rhodium and iridium show a maximum oxidation state of +6, while the most stable states are +4 and +3 for iridium and +3 for rhodium. The oxidation state +9, represented only by iridium in [IrO4]+, might be possible for its congener meitnerium in the nonafluoride (MtF9) and the [MtO4]+ cation, although [IrO4]+ is expected to be more stable than these meitnerium compounds. The tetrahalides of meitnerium have also been predicted to have similar stabilities to those of iridium, thus also allowing a stable +4 state. It is further expected that the maximum oxidation states of elements from bohrium (element 107) to darmstadtium (element 110) may be stable in the gas phase but not in aqueous solution. Meitnerium is expected to be a solid under normal conditions and assume a face-centered cubic crystal structure, similarly to its lighter congener iridium. It should be a very heavy metal with a density of around 37.4 g/cm3, which would be the second-highest of any of the 118 known elements, second only to that predicted for its neighbor hassium (41 g/cm3). In comparison, the densest known element that has had its density measured, osmium, has a density of only 22.61 g/cm3. This results from meitnerium's high atomic weight, the lanthanide and actinide contractions, and relativistic effects, although production of enough meitnerium to measure this quantity would be impractical, and the sample would quickly decay. Meitnerium is also predicted to be paramagnetic. Theoreticians have predicted the covalent radius of meitnerium to be 6 to 10 pm larger than that of iridium. The atomic radius of meitnerium is expected to be around 128 pm. 8) might also be possible. For chemical studies to be carried out on a transactinide, at least four atoms must be produced, the half-life of the isotope used must be at least 1 second, and the rate of production must be at least one atom per week. Even though the half-life of 278Mt, the most stable known meitnerium isotope, is 7.6 seconds, long enough to perform chemical studies, another obstacle is the need to increase the rate of production of meitnerium isotopes and allow experiments to carry on for weeks or months so that statistically significant results can be obtained. Separation and detection must be carried out continuously to separate out the meitnerium isotopes and have automated systems experiment on the gas-phase and solution chemistry of meitnerium, as the yields for heavier elements are predicted to be smaller than those for lighter elements; some of the separation techniques used for bohrium and hassium could be reused. However, the experimental chemistry of meitnerium has not received as much attention as that of the heavier elements from copernicium to livermorium. The Lawrence Berkeley National Laboratory attempted to synthesize the isotope 271Mt in 2002–2003 for a possible chemical investigation of meitnerium because it was expected that it might be more stable than the isotopes around it as it has 162 neutrons, a magic number for deformed nuclei; its half-life was predicted to be a few seconds, long enough for a chemical investigation. However, no atoms of 271Mt were detected, and this isotope of meitnerium is currently unknown. An experiment determining the chemical properties of a transactinide would need to compare a compound of that transactinide with analogous compounds of some of its lighter homologues: for example, in the chemical characterization of hassium, hassium tetroxide (HsO4) was compared with the analogous osmium compound, osmium tetroxide (OsO4). In a preliminary step towards determining the chemical properties of meitnerium, the GSI attempted sublimation of the rhodium compounds rhodium(III) oxide (Rh2O3) and rhodium(III) chloride (RhCl3). However, macroscopic amounts of the oxide would not sublimate until 1000 °C and the chloride would not until 780 °C, and then only in the presence of carbon aerosol particles: these temperatures are far too high for such procedures to be used on meitnerium, as most of the current methods used for the investigation of the chemistry of superheavy elements do not work above 500 °C. Following the 2014 successful synthesis of seaborgium hexacarbonyl, Sg(CO)6, studies were conducted with the stable transition metals of groups 7 through 9, suggesting that carbonyl formation could be extended to further probe the chemistries of the early 6d transition metals from rutherfordium to meitnerium inclusive. Nevertheless, the challenges of low half-lives and difficult production reactions make meitnerium difficult to access for radiochemists, though the isotopes 278Mt and 276Mt are long-lived enough for chemical research and may be produced in the decay chains of 294Ts and 288Mc respectively. 276Mt is likely more suitable, since producing tennessine requires a rare and rather short-lived berkelium target. The isotope 270Mt, observed in the decay chain of 278Nh with a half-life of 0.69 seconds, may also be sufficiently long-lived for chemical investigations, though a direct synthesis route leading to this isotope and more precise measurements of its decay properties would be required. ^ Emsley, John (2003). Nature's Building Blocks. Oxford University Press. ISBN 978-0198503408. Retrieved November 12, 2012. ^ "Meitnerium". Periodic Table of Videos. The University of Nottingham. Retrieved October 15, 2012. ^ a b c d e f g h i j k l m n o p q Hoffman, Darleane C.; Lee, Diana M.; Pershina, Valeria (2006). "Transactinides and the future elements". In Morss; Edelstein, Norman M.; Fuger, Jean (eds.). The Chemistry of the Actinide and Transactinide Elements (3rd ed.). Dordrecht, The Netherlands: Springer Science+Business Media. ISBN 1-4020-3555-1. ^ a b c d Östlin, A.; Vitos, L. (2011). "First-principles calculation of the structural stability of 6d transition metals". Physical Review B. 84 (11). Bibcode:2011PhRvB..84k3104O. doi:10.1103/PhysRevB.84.113104. ^ Thierfelder, C.; Schwerdtfeger, P.; Heßberger, F. P.; Hofmann, S. (2008). "Dirac-Hartree-Fock studies of X-ray transitions in meitnerium". The European Physical Journal A. 36 (2): 227. Bibcode:2008EPJA...36..227T. doi:10.1140/epja/i2008-10584-7. ^ a b Ionova, G. V.; Ionova, I. S.; Mikhalko, V. K.; Gerasimova, G. A.; Kostrubov, Yu. N.; Suraeva, N. I. (2004). "Halides of Tetravalent Transactinides (Rf, Db, Sg, Bh, Hs, Mt, 110th Element): Physicochemical Properties". Russian Journal of Coordination Chemistry. 30 (5): 352. doi:10.1023/B:RUCO.0000026006.39497.82. ^ a b Himmel, Daniel; Knapp, Carsten; Patzschke, Michael; Riedel, Sebastian (2010). "How Far Can We Go? Quantum-Chemical Investigations of Oxidation State +IX". ChemPhysChem. 11 (4): 865–9. doi:10.1002/cphc.200900910. PMID 20127784. ^ a b c Fricke, Burkhard (1975). "Superheavy elements: a prediction of their chemical and physical properties". Recent Impact of Physics on Inorganic Chemistry. 21: 89–144. doi:10.1007/BFb0116498. Retrieved October 4, 2013. ^ a b Saito, Shiro L. (2009). "Hartree–Fock–Roothaan energies and expectation values for the neutral atoms He to Uuo: The B-spline expansion method". Atomic Data and Nuclear Data Tables. 95 (6): 836. Bibcode:2009ADNDT..95..836S. doi:10.1016/j.adt.2009.06.001. ^ Hofmann, S.; Heinz, S.; Mann, R.; Maurer, J.; Münzenberg, G.; Antalic, S.; Barth, W.; Burkhard, H. G.; Dahl, L.; Eberhardt, K.; Grzywacz, R.; Hamilton, J. H.; Henderson, R. A.; Kenneally, J. M.; Kindler, B.; Kojouharov, I.; Lang, R.; Lommel, B.; Miernik, K.; Miller, D.; Moody, K. J.; Morita, K.; Nishio, K.; Popeko, A. G.; Roberto, J. B.; Runke, J.; Rykaczewski, K. P.; Saro, S.; Scheidenberger, C.; Schött, H. J.; Shaughnessy, D. A.; Stoyer, M. A.; Thörle-Popiesch, P.; Tinschert, K.; Trautmann, N.; Uusitalo, J.; Yeremin, A. V. (2016). "Review of even element super-heavy nuclei and search for element 120". The European Physics Journal A. 2016 (52). Bibcode:2016EPJA...52..180H. doi:10.1140/epja/i2016-16180-4. ^ a b Münzenberg, G.; Armbruster, P.; Heßberger, F. P.; Hofmann, S.; Poppensieker, K.; Reisdorf, W.; Schneider, J. H. R.; Schneider, W. F. W.; Schmidt, K.-H.; Sahm, C.-C.; Vermeulen, D. (1982). "Observation of one correlated α-decay in the reaction 58Fe on 209Bi→267109". Zeitschrift für Physik A. 309 (1): 89. Bibcode:1982ZPhyA.309...89M. doi:10.1007/BF01420157. ^ a b "Names and symbols of transfermium elements (IUPAC Recommendations 1994)". Pure and Applied Chemistry. 66 (12): 2419. 1994. doi:10.1351/pac199466122419. ^ a b Rayner-Canham, Geoff; Zheng, Zheng (2007). "Naming elements after scientists: An account of a controversy". Foundations of Chemistry. 10: 13. doi:10.1007/s10698-007-9042-1. ^ Bentzen, S. M. (2000). "Lise Meitner and Niels Bohr—a historical note". Acta Oncologica. 39 (8): 1002–1003. doi:10.1080/02841860050216016. PMID 11206992. ^ Kyle, R. A.; Shampo, M. A. (1981). "Lise Meitner". JAMA: the Journal of the American Medical Association. 245 (20): 2021. doi:10.1001/jama.245.20.2021. PMID 7014939. ^ Frisch, O. R. (1973). "Distinguished Nuclear Pioneer—1973. Lise Meitner". Journal of Nuclear Medicine. 14 (6): 365–371. PMID 4573793. ^ a b c d Griffith, W. P. (2008). "The Periodic Table and the Platinum Group Metals". Platinum Metals Review. 52 (2): 114. doi:10.1595/147106708X297486. ^ Rife, Patricia (2003). "Meitnerium". Chemical & Engineering News. 81 (36): 186. doi:10.1021/cen-v081n036.p186. ^ Wiesner, Emilie; Settle, Frank A. (2001). "Politics, Chemistry, and the Discovery of Nuclear Fission". Journal of Chemical Education. 78 (7): 889. Bibcode:2001JChEd..78..889W. doi:10.1021/ed078p889. 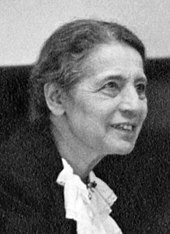 ^ "Meitnerium is named for the Austrian physicist Lise Meitner." in Meitnerium in Royal Society of Chemistry – Visual Element Periodic Table. Retrieved August 14, 2015. ^ a b c d e Sonzogni, Alejandro. "Interactive Chart of Nuclides". National Nuclear Data Center: Brookhaven National Laboratory. Retrieved June 6, 2008. ^ a b Gray, Theodore (2002–2010). "The Photographic Periodic Table of the Elements". periodictable.com. Retrieved November 16, 2012. ^ Hofmann, S.; Ninov, V.; Heßberger, F. P.; Armbruster, P.; Folger, H.; Münzenberg, G.; Schött, H. J.; Popeko, A. G.; Yeremin, A. V.; Andreyev, A. N.; Saro, S.; Janik, R.; Leino, M. (1995). "The new element 111" (PDF). Zeitschrift für Physik A. 350 (4): 281. Bibcode:1995ZPhyA.350..281H. doi:10.1007/BF01291182. Archived from the original (PDF) on January 16, 2014. ^ a b c d Oganessian, Yu. Ts. ; Penionzhkevich, Yu. E.; Cherepanov, E. A. (2007). "Heaviest Nuclei Produced in 48Ca-induced Reactions (Synthesis and Decay Properties)". AIP Conference Proceedings. 912: 235. doi:10.1063/1.2746600. ^ Morita, Kosuke; Morimoto, Kouji; Kaji, Daiya; Akiyama, Takahiro; Goto, Sin-ichi; Haba, Hiromitsu; Ideguchi, Eiji; Kanungo, Rituparna; Katori, Kenji; Koura, Hiroyuki; Kudo, Hisaaki; Ohnishi, Tetsuya; Ozawa, Akira; Suda, Toshimi; Sueki, Keisuke; Xu, HuShan; Yamaguchi, Takayuki; Yoneda, Akira; Yoshida, Atsushi; Zhao, YuLiang (2004). "Experiment on the Synthesis of Element 113 in the Reaction 209Bi(70Zn,n)278113". Journal of the Physical Society of Japan. 73 (10): 2593–2596. Bibcode:2004JPSJ...73.2593M. doi:10.1143/JPSJ.73.2593. ^ Oganessian, Yuri Ts. ; Abdullin, F. Sh. ; Alexander, C.; et al. (May 30, 2013). "Experimental studies of the 249Bk + 48Ca reaction including decay properties and excitation function for isotopes of element 117, and discovery of the new isotope 277Mt". Physical Review C. American Physical Society. 87 (054621). Bibcode:2013PhRvC..87e4621O. doi:10.1103/PhysRevC.87.054621. ^ Oganessian, Yuri Ts. ; Abdullin, F. Sh. ; Bailey, P. D.; et al. (April 9, 2010). "Synthesis of a New Element with Atomic Number Z=117". Physical Review Letters. American Physical Society. 104 (142502): 142502. Bibcode:2010PhRvL.104n2502O. doi:10.1103/PhysRevLett.104.142502. PMID 20481935. ^ Pyykkö, Pekka; Atsumi, Michiko (2009). "Molecular Double-Bond Covalent Radii for Elements Li—E112". Chemistry: A European Journal. 15 (46): 12770. doi:10.1002/chem.200901472. ^ a b Düllmann, Christoph E. (2012). "Superheavy elements at GSI: a broad research program with element 114 in the focus of physics and chemistry". Radiochimica Acta. 100 (2): 67–74. doi:10.1524/ract.2011.1842. ^ Eichler, Robert (2013). "First foot prints of chemistry on the shore of the Island of Superheavy Elements" (PDF). Journal of Physics: Conference Series. IOP Science. 420 (1): 012003. arXiv:1212.4292. doi:10.1088/1742-6596/420/1/012003. Retrieved September 11, 2014. ^ Smolańczuk, R. (1997). "Properties of the hypothetical spherical superheavy nuclei". Phys. Rev. C. 56 (2): 812–24. Bibcode:1997PhRvC..56..812S. doi:10.1103/PhysRevC.56.812. ^ a b Even, J.; et al. (2015). "In situ synthesis of volatile carbonyl complexes with short-lived nuclides". Journal of Radioanalytical and Nuclear Chemistry. 303 (3): 2457–2466. doi:10.1007/s10967-014-3793-7. ^ Düllmann, Ch. E for a Univ. Bern - PSI - GSI - JINR - LBNL - Univ. Mainz - FZR - IMP - collaboration. "Chemical investigation of hassium (Hs, Z=108)" (PDF). Archived from the original (PDF) on November 18, 2012. Retrieved October 15, 2012. ^ Loveland, Walter (September 19, 2014). "Superheavy carbonyls". Science. 345 (6203): 1451–2. Bibcode:2014Sci...345.1451L. doi:10.1126/science.1259349. PMID 25237088. ^ Even, Julia (2016). Chemistry aided nuclear physics studies (PDF). Nobel Symposium NS160 – Chemistry and Physics of Heavy and Superheavy Elements. doi:10.1051/epjconf/201613107008. ^ Moody, Ken. "Synthesis of Superheavy Elements". In Schädel, Matthias; Shaughnessy, Dawn (eds.). The Chemistry of Superheavy Elements (2nd ed.). Springer Science & Business Media. pp. 24–8. ISBN 9783642374661.